Today we're back home after four days in Missouri, visiting my parents. My family is spread out across the U.S. so we simply aren't able to see each other, at least not all together, very often. In this case my brother and his wife from San Diego were there, as well as my sister and her husband and daughter from South Carolina. The main reason for our trip: Yesterday my dad, the Rev. 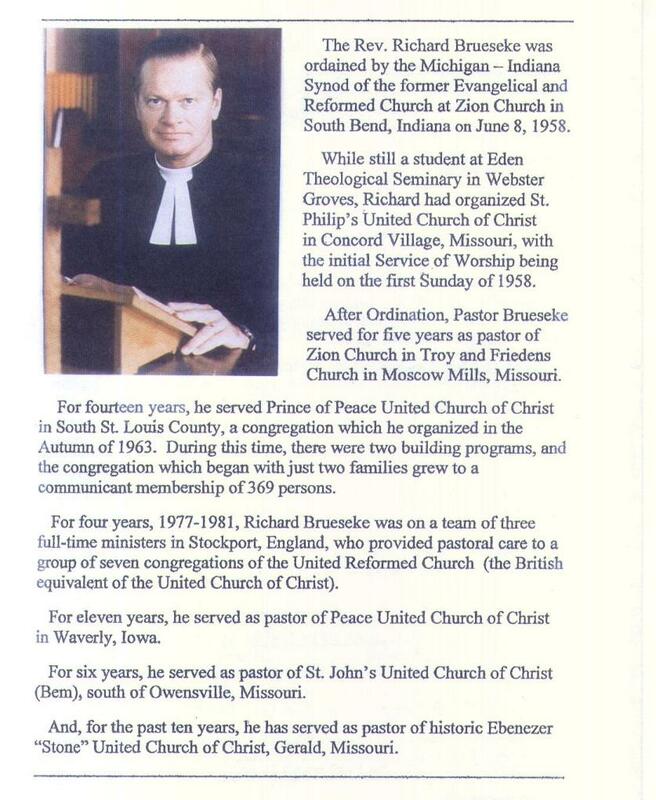 Richard S. Brueseke, celebrated his 50th anniversary as an ordained pastor. The celebration took place at Ebenezer "Stone" Church (U.C.C. ), out in the country near Gerald, MO, exactly 50 years to the day of his ordination, June 8, 1958 (in Indiana). As many of you know, I personally, in my heart, have been journeying away from the whole idea of being involved in the way(s) that "church" is traditionally done. But one of many things that keeps me from all-out rejecting the notion that God can't, won't or doesn't work in traditional churches, and through the people in them, is the lifetime ministry of my dad, along with my mom, who also became an ordained pastor over a decade ago. I've seen that my dad's life as a pastor has not been at all limited to the four walls of each individual church he has served. In every place he has pastored during those 50 years, from Troy, Moscow Mills and St. Louis, Missouri, to Stockport England, to Waverly, Iowa, and back to Bem and Owensville, Missouri, my dad has become actively involved in the lives of those in his congregations and he has reached out to serve the greater communities as well. Not only has he wholeheartedly participated in various activities that other people have created, organized and led in those communities, but he himself has also led the way in organizing and leading many other events, organizations and activities that have served to help others and to show them God's love in all kinds of ways. A constant theme that has been inseparably woven into my dad's lifetime of ministry - a constant refrain of his - is "love God best by loving your fellow human beings." He has not only talked the talk in this, but he has walked the walk. And he continues to do so. As he himself said yesterday, "God's not done with me yet," referring to his ongoing call to serve people. During the anniversary service yesterday afternoon, many people stood up to give "testimonies" of my dad's ministry in their lives. Friends, colleagues, church members and family members spoke of dad's commitment to helping and serving others. Even a woman who is a travel agent, who doesn't know dad in the ways that many people know him, attended the service and stood up to testify of how he not only comes into the agency to make travel plans, but how he sits and chats with her about all kinds of other things as well. Another person seemed to speak for many when she said that my dad and mom, in many big ways, have taught people to think outside the box. They have not only taught it, they have led the way. I had a couple of emotional moments during the service. I felt like a blubbering idiot, because everyone else who took the mic was so very well contained - but yet it's just who I am! See, my dad had asked me to read Isaiah 6:1-8 (see below), and my brother, Barry, to read 1 Cor 15:1-11 ("I am the least of the apostles... but by the grace of God I am what I am"). The officiating pastor read Luke 5:1-11 ("And Jesus said to Simon, 'Do not be afraid. From now on you will catch men'"). These passages lined up together with the theme of the service - the message of God calling people to follow Him, and their responses to Him. Well, as the service had begun, two or three letters/emails had been read from various people who weren't able to make it to the service, but who had very kind words to say about their relationships with my dad, and his impact on their lives. It was very touching. Also, I had previously been thinking about how much the passage from Isaiah means to me personally, and how it fits the call my dad has followed all these years. When it came time for me to read my passage, I was doing just fine but then I began to choke up slightly at verse 7, where the angel says to Isaiah, "behold this [the live coal] has touched your lips; your iniquity is taken away; and your sin purged." 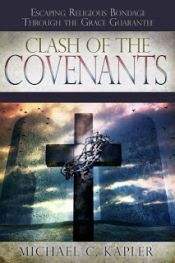 As you may have realized from my blogs, the message of our sins having been taken away is a huge message that is deep in my heart and that I always long to share with whoever will listen. And here I was, really for the first time, declaring this message live and in person to a crowd of people. It meant a lot to me. But even more than that, during the past few days I had been picturing my dad 50+ years ago as a man in his early to mid 20's responding to God's call on his life. My dad tells me he originally rebelled against the idea of going into the ministry. He even says he rebelled passionately. Part of the rebellion had to do with the pressure placed on him as he himself was the son of a preacher. There were other contributing factors to his rebellion as well, but yet God used various people and events, including the wisdom of a college professor who saw things in him that he hadn't seen, and a trip to a refugee camp in Austria, to begin to speak to his heart and lead him into this lifelong ministry. Then I said, “Here am I! Send me." Anway, it was a great day. The service really is one to be remembered, and the reception was great as well. 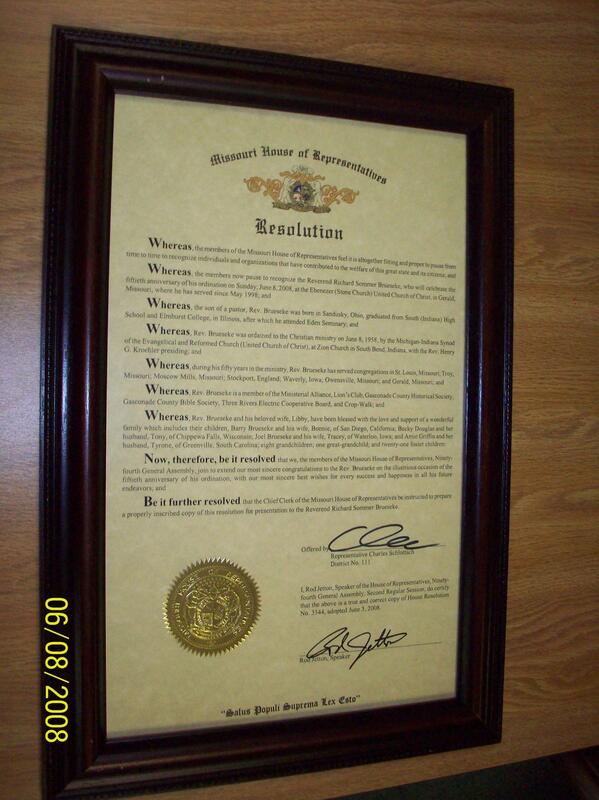 One surprise that happened early on in the service is that one of the members of my mom's former church who happens to be a representative in the Missouri House, presented my dad with a framed inscription of a Resolution passed in the Missouri House of Representatives (see pic here) that recognizes his contributions to the welfare of the state. This is quite an honor for my dad. As you can tell, I'm proud of my dad. There perhaps are some differences here and there in theology and doctrine, but that really means nothing because when it comes to living the life of love, I have absolutely nothing but respect and thankfulness toward my dad for showing me the way in deed. So I made my way on over to your neck of the woods. I need to check in here more often. Yes, I'm glad you have your dad's experience within the IC to offer some balance to all those who have nothing kind to say about the potential for Father to use, even it (IC), to give life to others. Sounds like you have a great heritage to draw from! And congratulations on being able to be real in that setting! I'm sure many hearts were touched by your authenticity. Joel, this is beautiful. You are very fortunate to have the example of parents whom intimately know the Lord. Thanks for sharing.